Tonight as I write, we are getting a very nice rain. It has been raining for over three hours. The weatherman says it should rain off and on all night. This is our first rain since the 5th of July. It is pretty dry here. The grasses, the gardens and the trees are drinking their fill as well. We were featured in the current issue of Countryside magazine. The horses and I are looking forward to farming full time. I thirst for that day. The horses just like having me near. I am sure that breathing on them is as good for them as it is for me. The peace from our partnership fills me and satisfies my soul. I write a column in Rural Heritage magazine. In the current issue, I describe a way to grow pork chops in your backyard, complete with directions on how to set up gravity water flow to a pig drinker. It’s all about water. The moisture of life, without which we die. I do all that I can to protect the quality of water that leaves my farm. I catch two ponds full. I maintain a ten acre wetland that borders a large stream. I use best management practices when logging, farming and especially when spreading manure. I am a good neighbor, a good steward and a protector of the resources that this farm holds. I am so careful with water, that I have even been called a …drip! 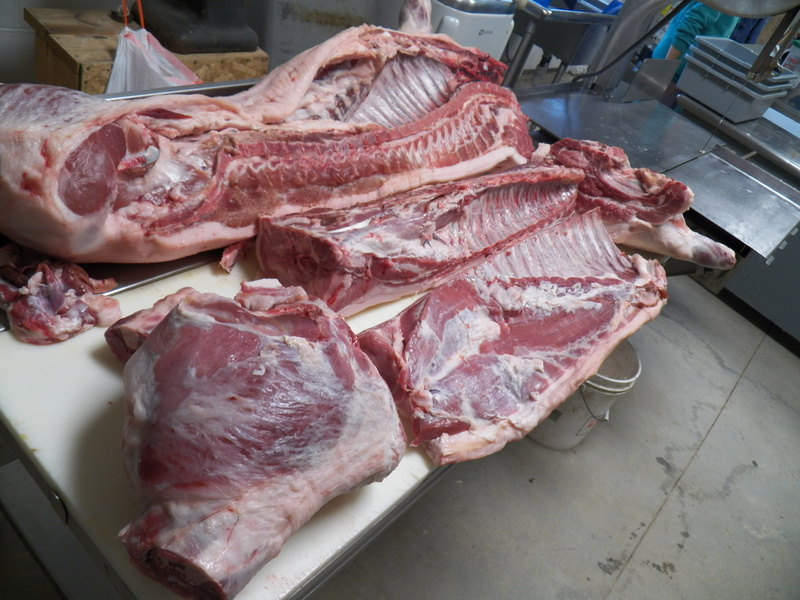 Tuesday, I butchered these two nice hogs. They walked outside to their play area, looked up at me and dropped in their tracks. There was no stress, no shouting, no problem at all. They led a happy stress free life here. 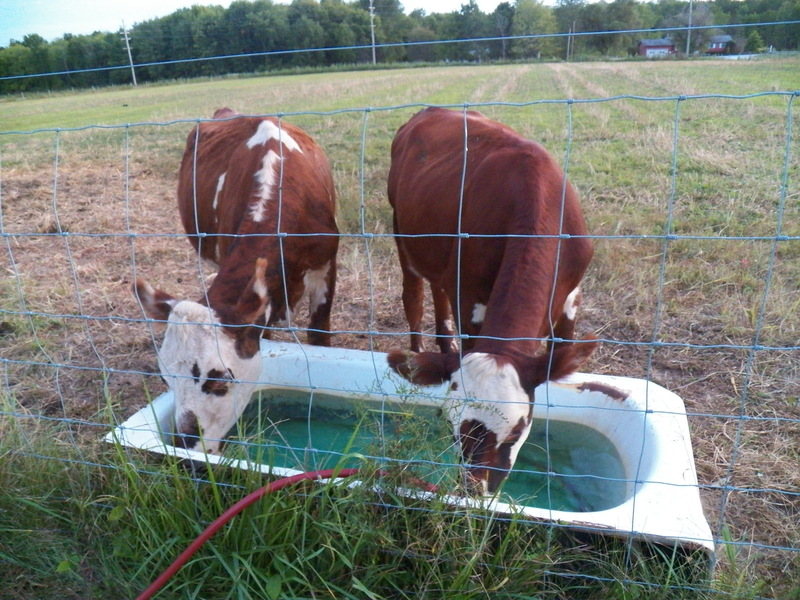 They had a clean dry bed, all they could eat and drink and access to a play area every day. The meat tastes wonderful. 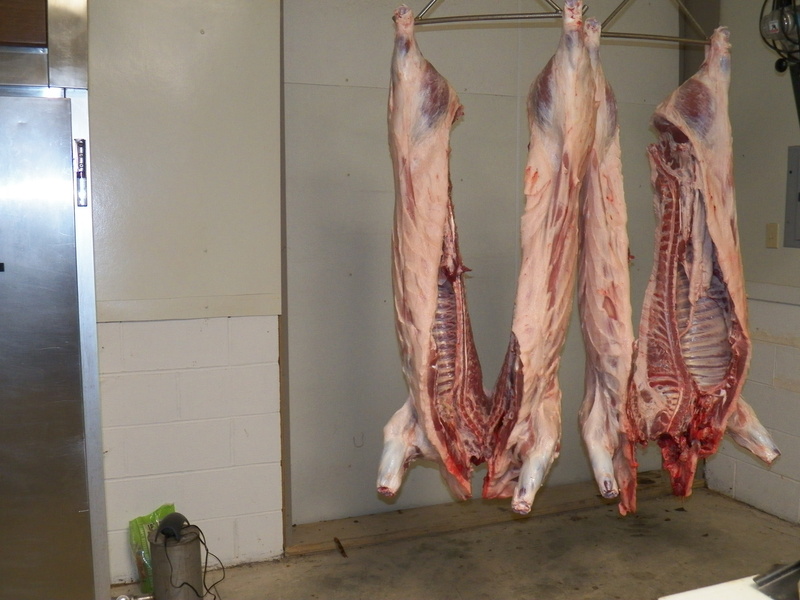 Today we cut them up, made fresh sausage, pork chops, roasts and spare ribs. The hams and bacons have been brined and await smoking and cooking in a few days. It was the first big job we did in the new slaughterhouse. The building and equipment worked flawlessly. There was plenty of room to work and having the hot and cold water was awesome! We had a nice full day with friends and family. My grandchildren made their own sausage, then cooked it in a pan. Fresh sausage sandwiches don’t come much fresher than that 😮 The children helped stuff sausage into casings and even leant a hand during clean up. They were very involved and have a good understanding where their food comes from. They are 5 and 8 and well on their way to becoming homesteaders. I am tired, but very happy. I see the next generation learning skills handed down to me from my grandparents. My son worked right along beside me. He does better every time we butcher. He made the primal cuts, took the spareribs off his bacon. He deboned many pieces and helped with the brining process. He did most of the grinding and paid close attention to the seasoning process. My wife gave lessons to our daughter-in-law as she wrapped her family’s meat. Yes, it was a very good day! Primal cuts, ready to go!